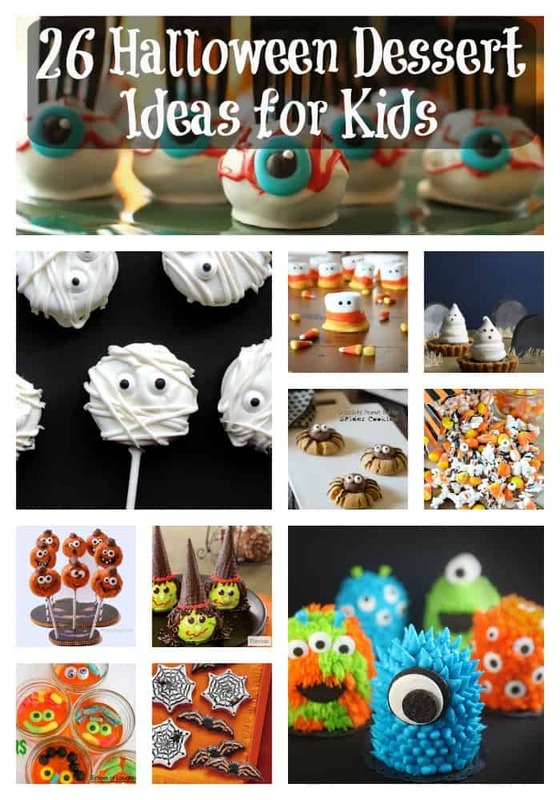 Bakerella manages to dream up another fun treat for Halloween every kid (and parent) will love! 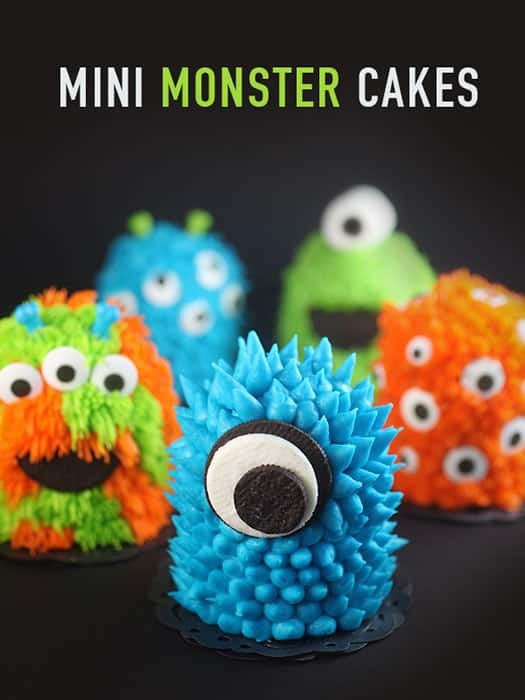 These Mini Monster Cakes are made from two cupcakes, frosting, candy eyes, and oreos. Choose your favorite monster or make all four designs. 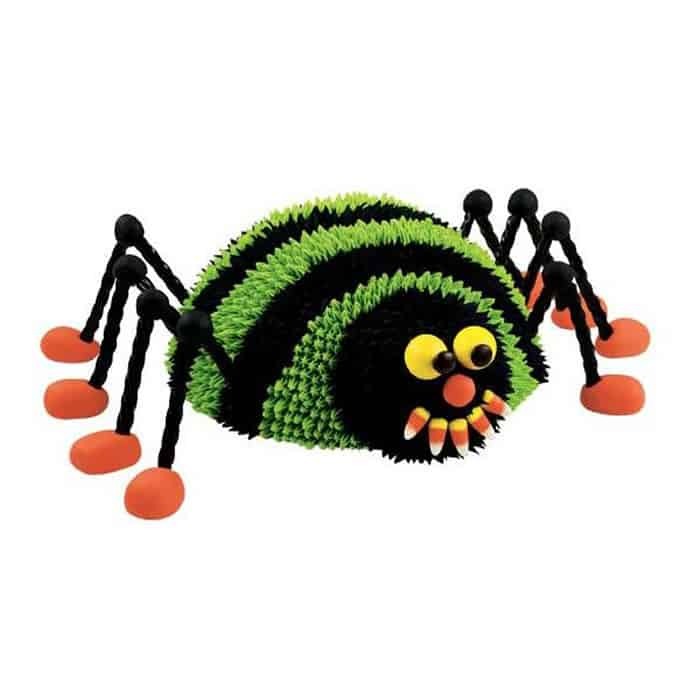 This will be the hit of the Halloween party! 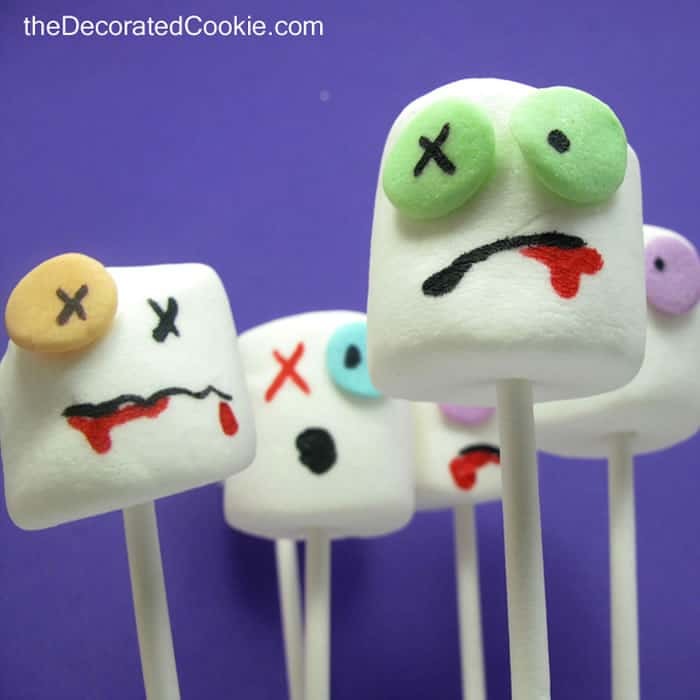 The kids can make these simple Marshmallow Zombies in any design their creative minds can conceive. All you’ll need are marshmallows, lollipop sticks, large confetti sprinkles, light corn syrup, and edible markers in red and black. 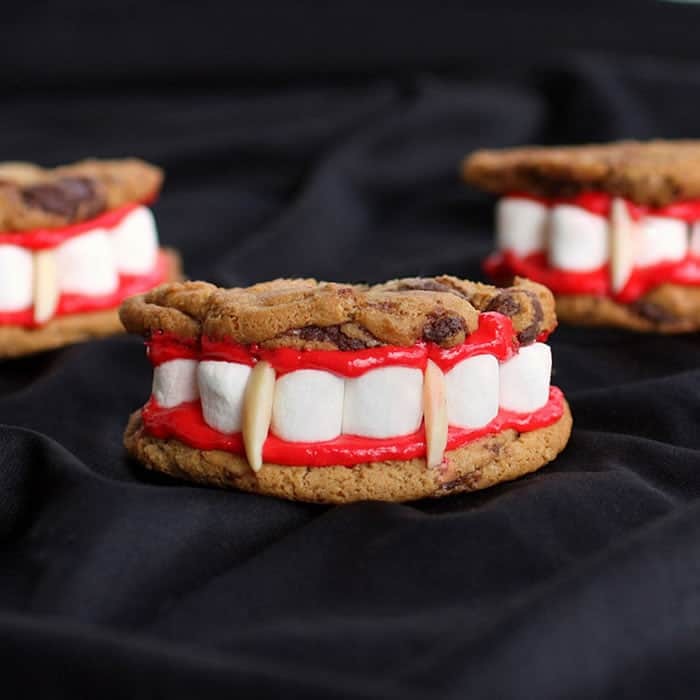 Originally a Nestle’ Toll House Spooktacular Baking Contest 2nd place winner, the Dracula dentures are easy to make so even the kiddos can help. With just a few ingredients and pre-made Toll House cookie dough, its fast too! 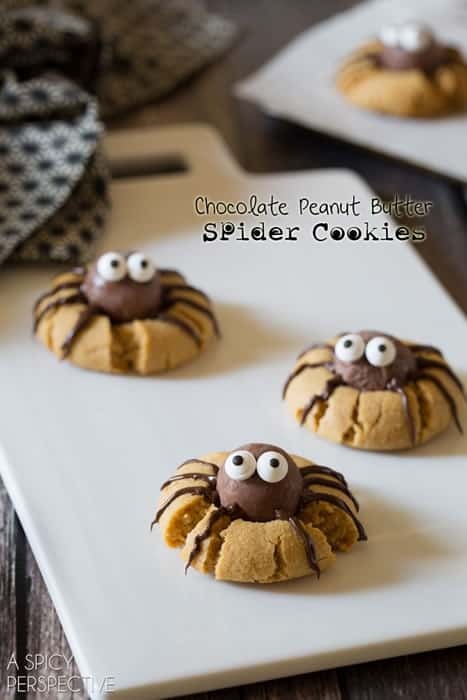 These cute little peanut butter spider cookies are easy to decorate with a Lindor Chocolate Truffle, candy eyes and some chocolate legs. Cute and delicious! 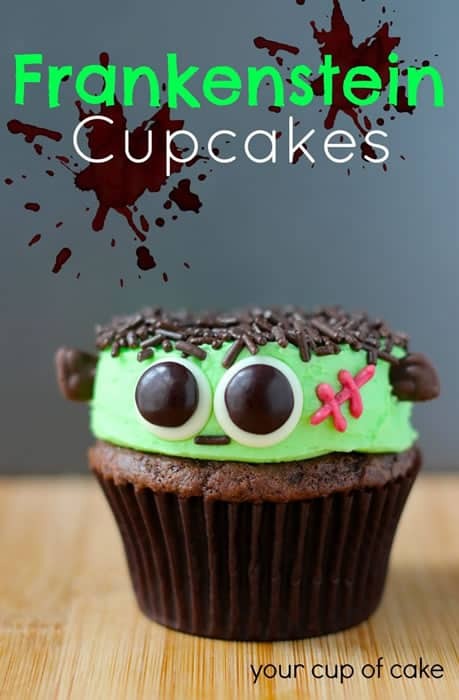 Super cute Frankenstein Cupcakes are the brain child of Lizzy at Your Cup of Cake. Simple to make using chocolate sprinkles, M&Ms and green frosting. She even has a Mrs. Frankenstein cupcake! 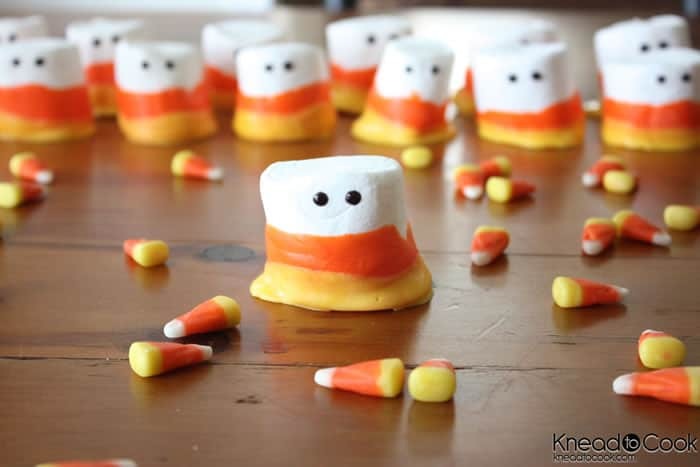 These Halloween candy corn marshmallows are quick to make and you only need a couple Wilton candy melts and a black gel icing tube for the eyes. A great project for the kids, too! 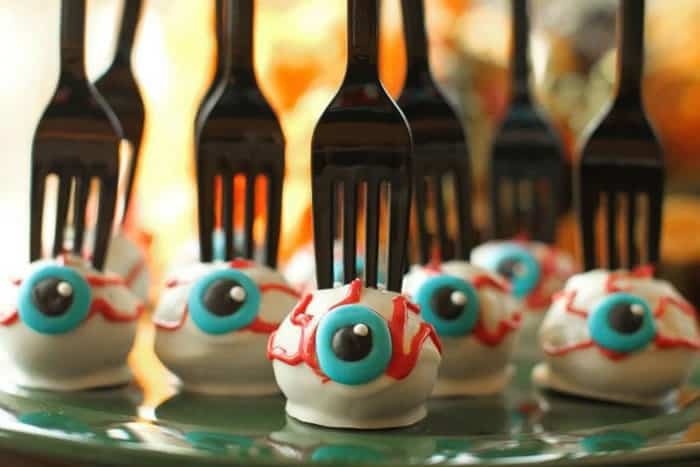 Gruesome and delicious Halloween treats for kids, these Eyeball Cake Popshttps://treats4tatas.wordpress.com/2012/09/13/bucket-list/ can be made with any flavor of cake and frosting (although red velvet might be the best), a little decorating chocolate and plastic forks. 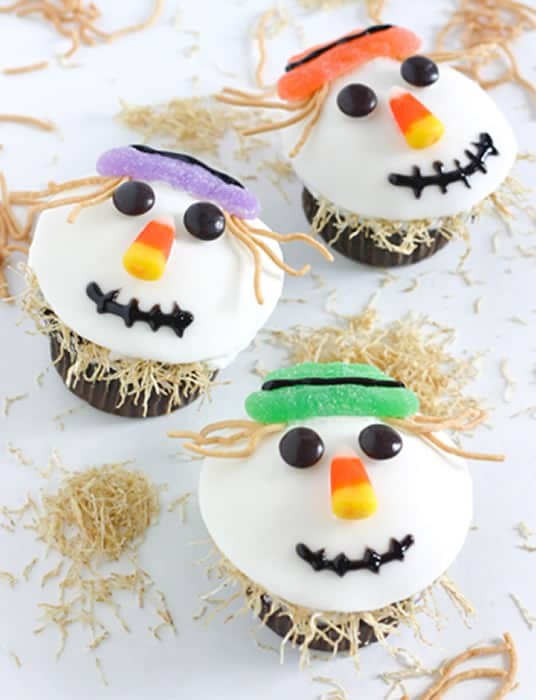 Chow mein noodles and shredded wheat make these Scarecrow Cupcakes look authentic and still edible! 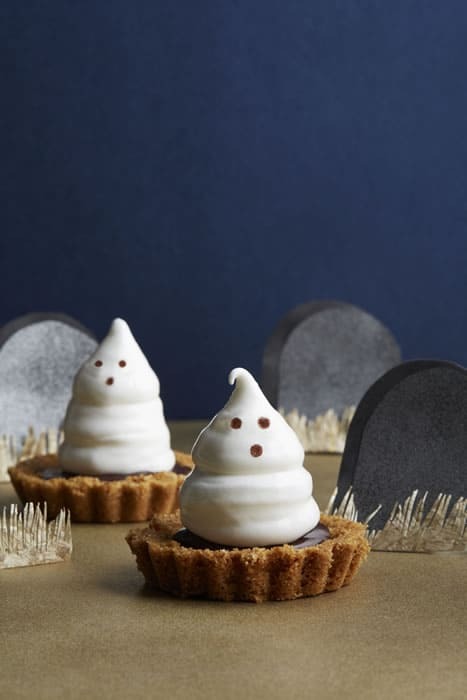 With only eight ingredients, these Meringue Ghost Tartlets are made with a graham cracker crust, a simple chocolate ganache, and meringue tops it off! 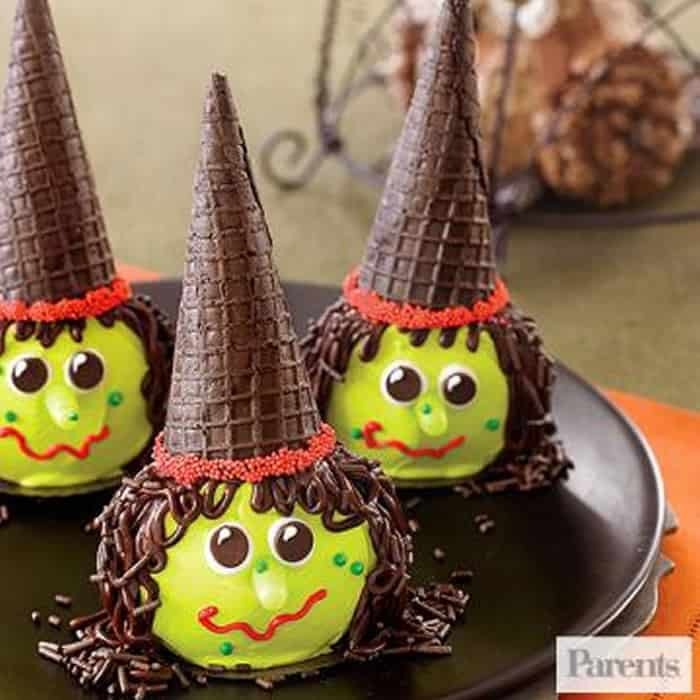 These adorable Witch Cupcakes feature a sideways sitting cupcake with an Oreo cone hat, Mike & Ikes for the nose, icing and chocolate jimmies make the hair. 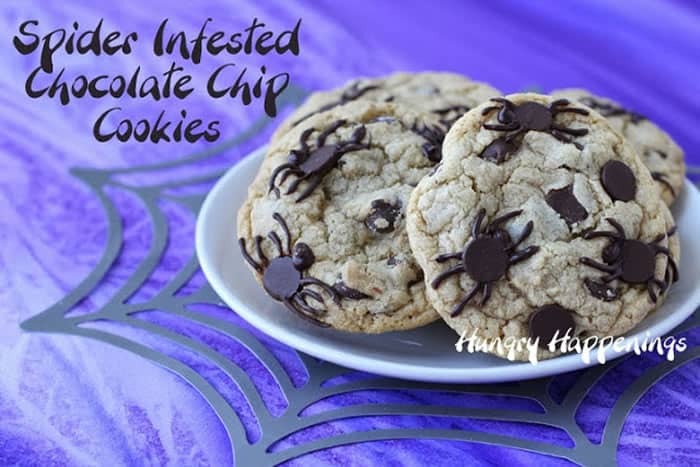 Will these Spider-Infested Chocolate Chip Cookies keep people away? I don’t think so! Check out her oatmeal raisin spider cookies too! 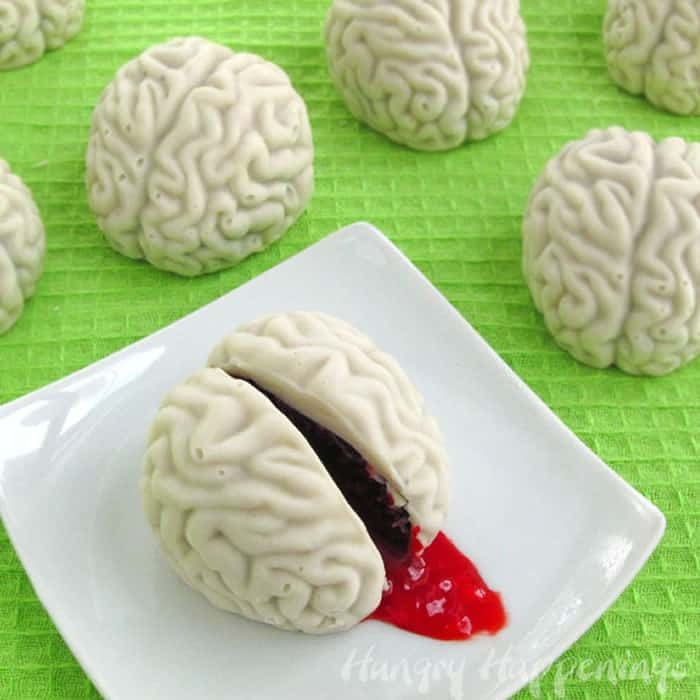 Beth from Hungry Happenings had a brilliant idea to form make pops into brain molds, and the cherry jam makes it look extra scary! 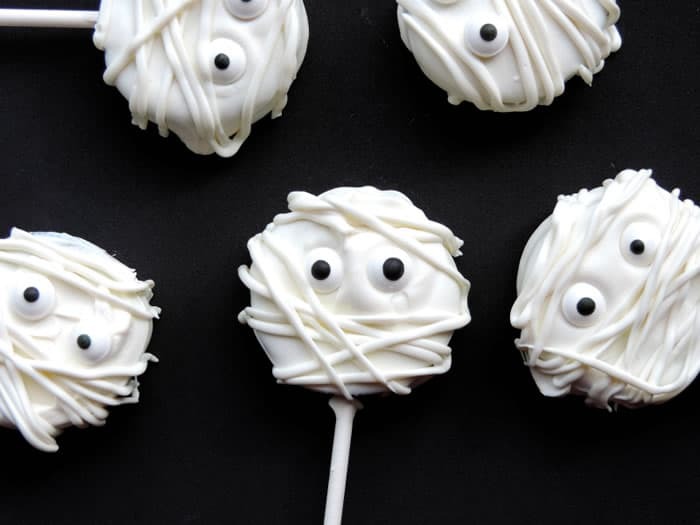 More cute than scary, these Oreo Mummy Pops look fun to make with a simple oreo on a lollipop stick, candy eyes, and white candy melts. That’s it! 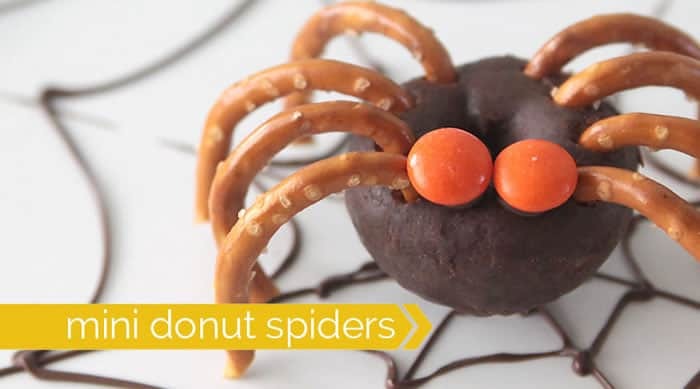 Mini Donut Spiders are simple to make with the kids and virtually no prep time needed! All you need are mini chocolate donuts, large pretzel twists, and M&Ms. 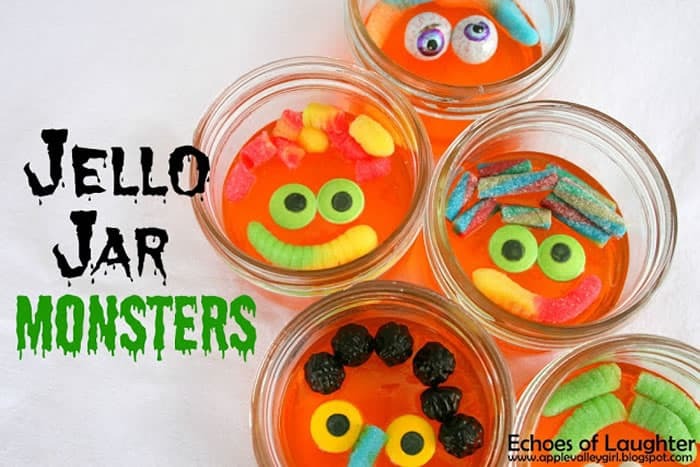 Little ones will love making these Jello Jar Monsters, and all you need are small mason jars, orange jello, candy eyes, and gummy candy for decorating. 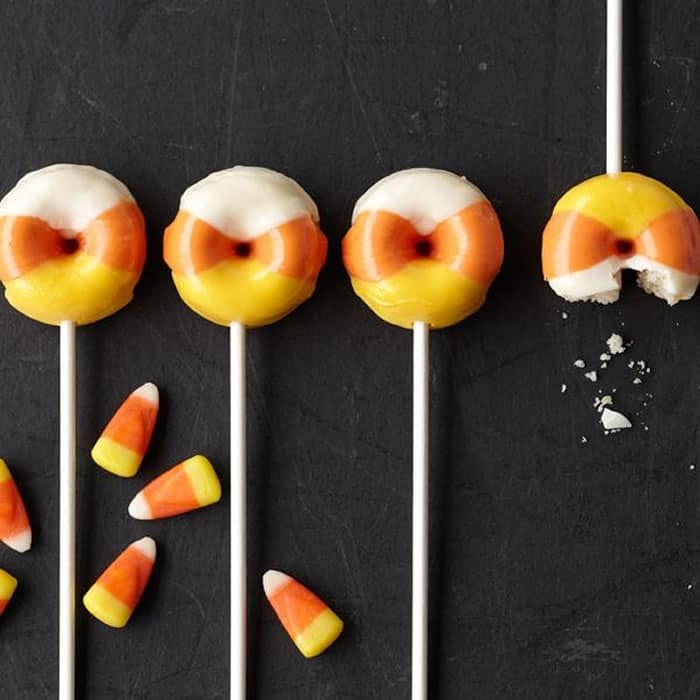 Make your own mini doughnuts or use the store bought doughnuts to make the Candy Corn Mini Doughnut Pops. All you need are lollipop sticks and three colors of candy melts! 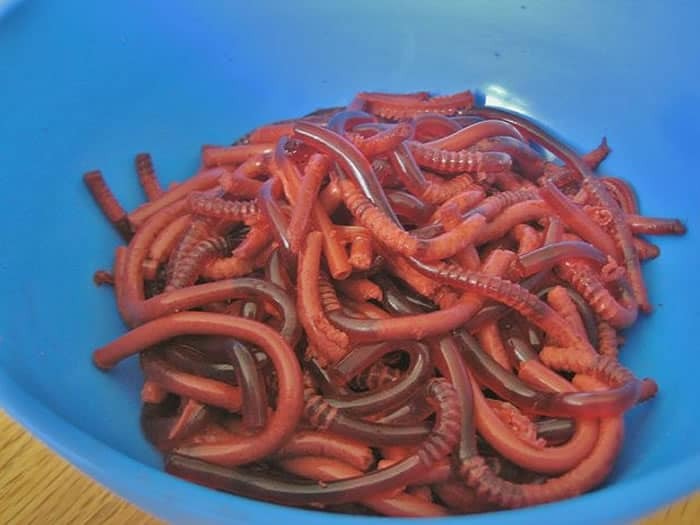 Sure, this bowl of Jello Worms looks really gross, but that’s what kids like, and they can eat it too! All you need is jello and drinking straws. 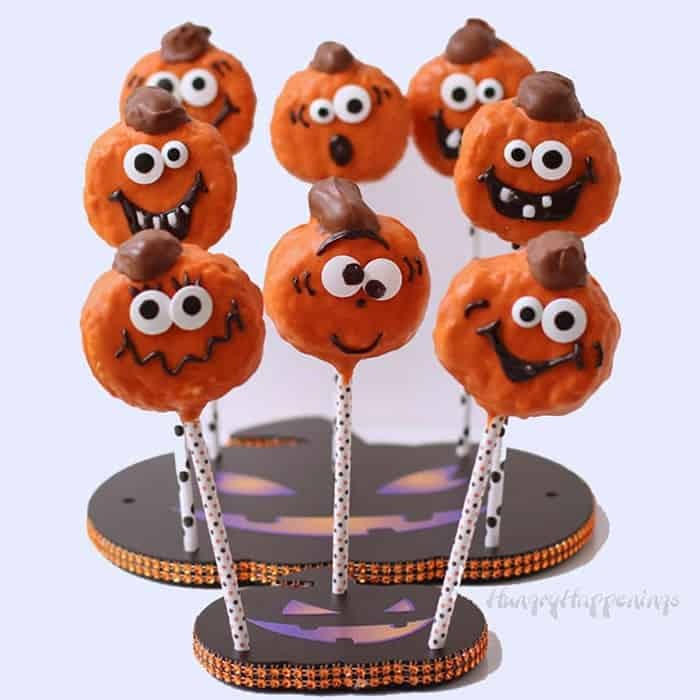 These happy Jack-o-Lantern Rice Krispie Pops are adorable and use simple candy eyes, chocolate melts and Halloween lollipop sticks. 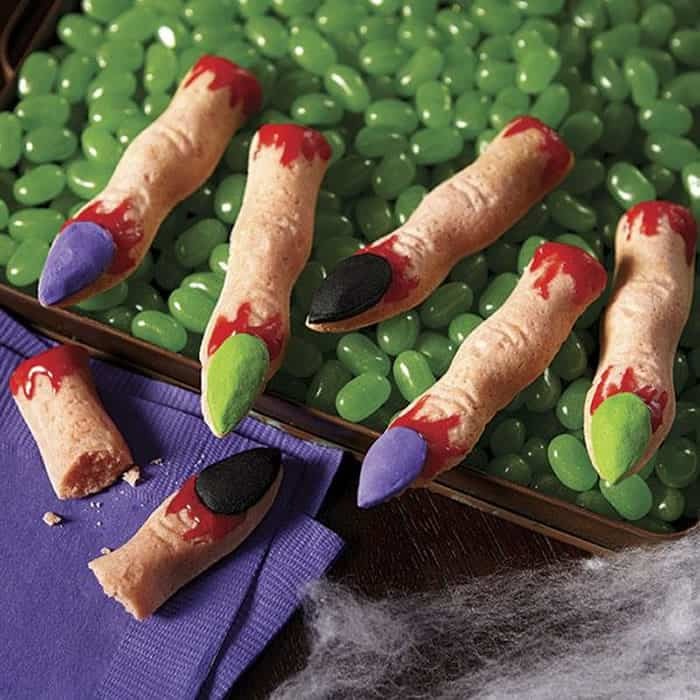 Simple sugar cookies are transformed in the Witch Finger pan into frightening Witch Finger Cookies. They’ll look so real, you may not get any takers! 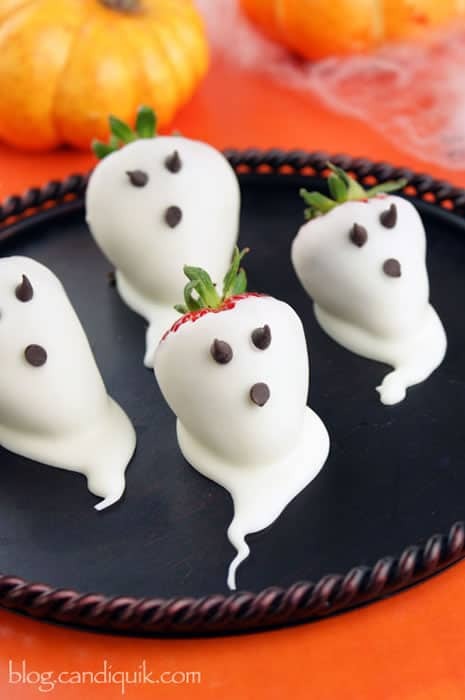 These Strawberry Ghosts are a cute take on a classic favorite Chocolate covered strawberries. Just add mini chocolate chips for the face. 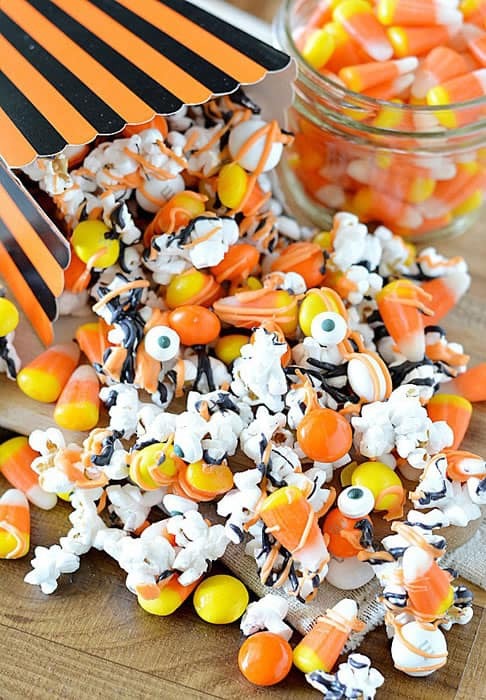 Popcorn has never looked so frightening! This Monster Munch is made of popcorn, M&Ms, candy corn, candy eyes, and candy melts. Definitely a quick and fun project for kids of every age! 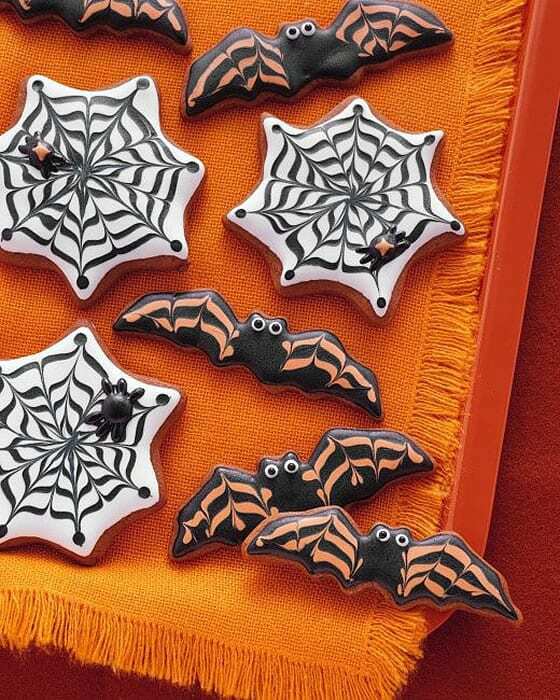 Martha Stewart has done it again with these amazingly decorated bat and spiderweb cookies. Definitely not for the baking newbie! 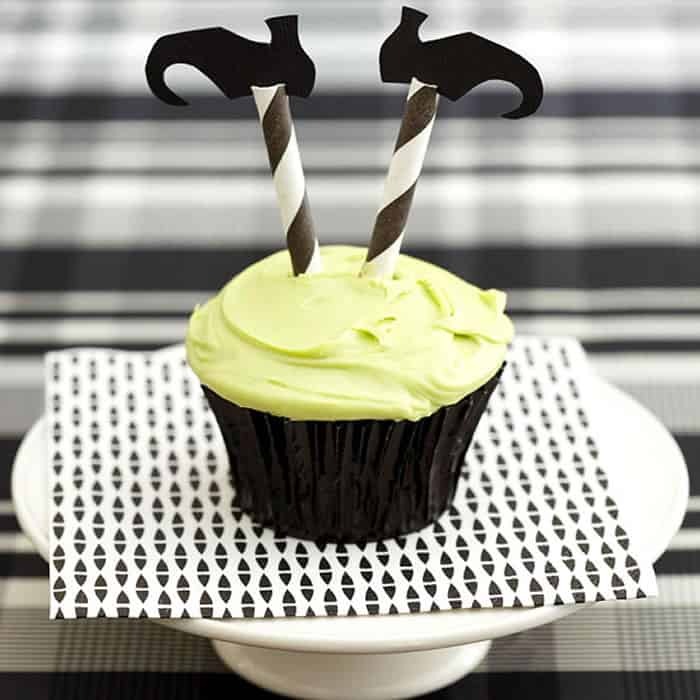 The Topsy Turvy Witch Cupcakes are simple cupcakes with added straws and cut-out witch feet. They even give you the feet pattern. 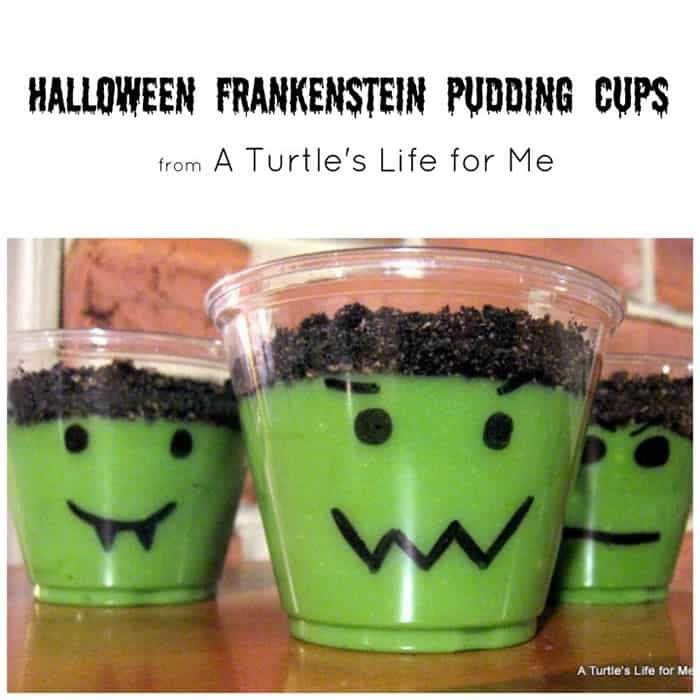 Natalie from a Turtle’s Life For Me made this super easy Frankenstein Pudding Cups for her daughter’s class. Simple vanilla pudding tinted green with Oreo crumbled on top. Faces courtesy of her daughter’s artistic side! 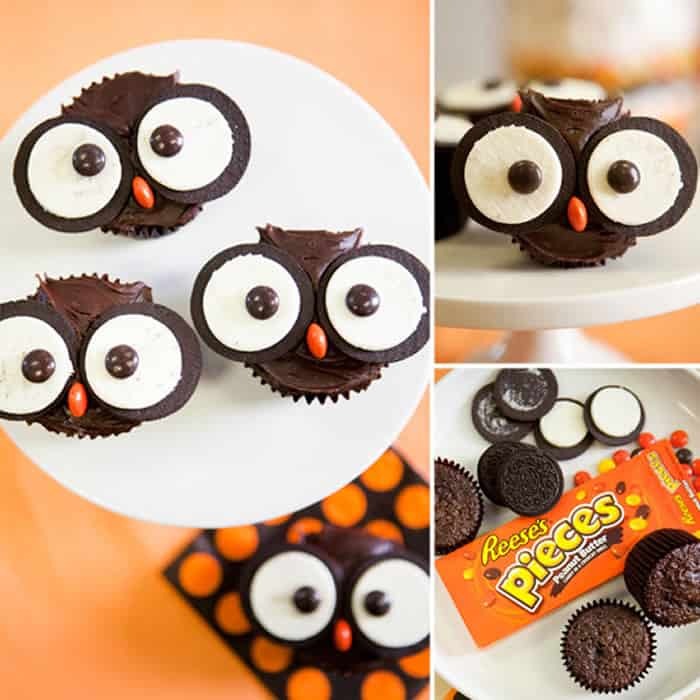 Instead of scary, these cute Owl Cupcakes combine chocolate cupcakes, Oreos, and Reese’s Pieces candy for a quick party favorite!